US humanitarian aid is now being concentrated in Cúcuta. It is the moment of truth for the plan designed by Guaidó and Leopoldo López : to encourage a rebellion at the rank and file of the Venezuelan army by tempting them with the food and medicine shipments that their own families need. 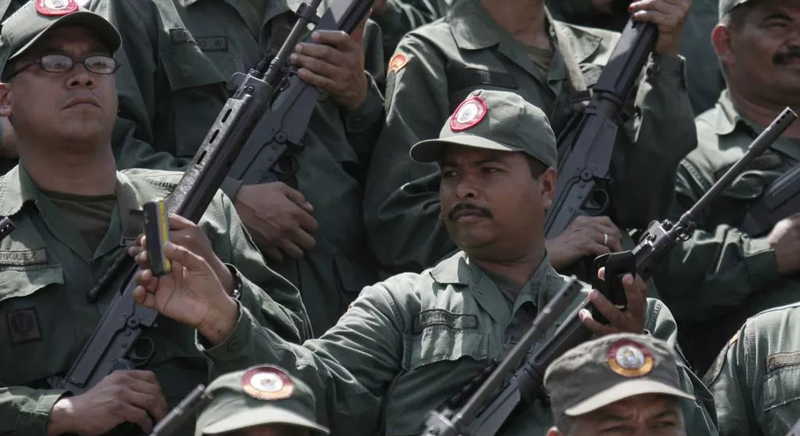 As much as the "Lima Group"  has promised not to invade Venezuela, the move is a textbook example of an asymmetric war, owing more in its conception to the "Green March"  than to the Russian campaigns in Donbas or Crimea. It is hard to believe that the Venezuelan military high command, which manages the supply of provisions as a private monopoly, will be moved. The objective of the opposition plan is to foment a rebellion amongst the military rank and file that might force the high command to change sides so as not to lose control of their own troops. The odds for this are slim. Even if massive troop defections occur, they are more likely to give rise to a period of irregular warfare between the two great factions of the national bourgeoisie supported by their respective sponsors. That is, an imperialist war disguised as civil war, as in Syria. Paradoxically the announcement of the arrival of humanitarian aid was made days ago, thus increasing the arrival of new refugees into Colombia which has generated a political problem for the opposition. The refusal to use part of the aid to assist the mass of refugees in Cúcuta has separated the international Red Cross from the strategy and provided evidence, if it were needed, of the true objective of the operation, a fact which was only confirmed, at the last minute, by the Catholic Episcopal Conference. Meanwhile, Maduro has recovered the political initiative and his ability to drum up support. The demonstrations this weekend, led opposition parties to moderate their speeches and affirm that it is necessary to give a share of power to the Madurist faction at a time when the divisions between European Union countries — which are going so far as to affect German capital — reflect something more than Russian influence. After all, the big European companies with businesses in Venezuela, like Repsol, are more afraid of the effect of a civil war, or the predictable revanchism of the opposition and Americans on their balance sheets and future deals, than the survival of Madurismo. The regime is discovering that it is not so isolated and is preparing for an Al Assad-like resistance in case of the outbreak of civil war. And nobody really believes that the move will turn the situation towards the opposition in a clear way. Given that possible outcome, Uruguay, Mexico, Bolivia, Costa Rica, Ecuador and eight EU countries will meet today in Montevideo to open the way to an agreed outcome that would undermine the US, Brazil and Colombia. Maduro sees the initiative as giving him cards to play. Next Wednesday Duque and Trump will meet at the White House to evaluate strategies based on the results. The ghost of war and intervention is more present than ever. Democratic ideology is increasingly similar to the monarchical ideology of the final phase of the Ancien Regime. Then all conflicts were explained as the result of complicated dynastic disputes — who had the right to inherit what territory, and under what regime. Today is the same, only with constitutions and procedures. In both cases, they are nothing more than justifications for giving "legitimacy", now labelled "democratic", to struggles within a rapacious ruling class that has come to the end of its historical cycle and survives by feeding on the blood and misery of the whole of society. Venezuela is an example of how the impossibility of an independent development of national capital in the framework of a permanent and global crisis fractures the ruling bourgeoisie, by fanning the imperialist ambitions of neighbours and great powers, leading the country from an economic implosion towards war. Whether this agony finally ends in imperialist war disguised as a civil war between the two leaders of the Venezuelan bourgeoisie or not, it would be just another bloody outcome for something that we can already take for granted: the disaster that is the administration of society under a national capital that, under whatever faction, can only offer subordination to bigger capitals, exile, increasingly miserable living conditions and war. War or no war, one thing is certain, and that is the bourgeoisie — Chavista or oppositionist — cannot take society anywhere. There is no viable solution based on the nation and certainly not a capitalist one. Juan Guaidó was the compromise choice by the opposition to head the National Assembly in which they hold a majority but which Maduro has bypassed and ignored. Guaidó is the protégé of Leopoldo Lopez who is currently serving the next part of a 14 year sentence under house arrest. Lopez was the real leader of the opposition but is an abrasive and arrogant character. Guaidó apparently takes his instruction from him (they are on the phone several times a day) but has united the opposition as never before (and given the state of the economy it is amazing it has taken them so long). The speed with which the USA greeted the declaration of Guaidó as “interim president” (until Lopez is freed?) suggests that this was all coordinated beforehand and also with other LA states (Guaidó apparently spent a lot of time recently in Brazil). Formed in August 2017 to oppose the planned re-election of Maduro, the group consists today of Argentina, Brazil, Canada, Chile, Colombia, Costa Rica, Guatemala, Guyana, Honduras, Mexico, Panama, Paraguay, Peru and Santa Lucía. It is supported by the USA and EU. The Green March was a strategic mass demonstration in November 1975, coordinated by the Moroccan government, to force Spain to hand over the disputed, autonomous semi-metropolitan province of Spanish Sahara to Morocco. It eventually led to a 16 year war with the Sharawi Polisario Front that left Morocco in control of the bulk of the ex-Spanish colony.